According to The New York Times, Scott Walker is ending his 2016 campaign. After spending some time on top of the polls early on and two debates in which he stayed mainly in the background, Walker has apparently decided that seeking the Republican presidential nomination is no longer a lucrative idea. Sources told the Times that the short answer for why Walker is dropping out can be boiled down to one simple reason: money. 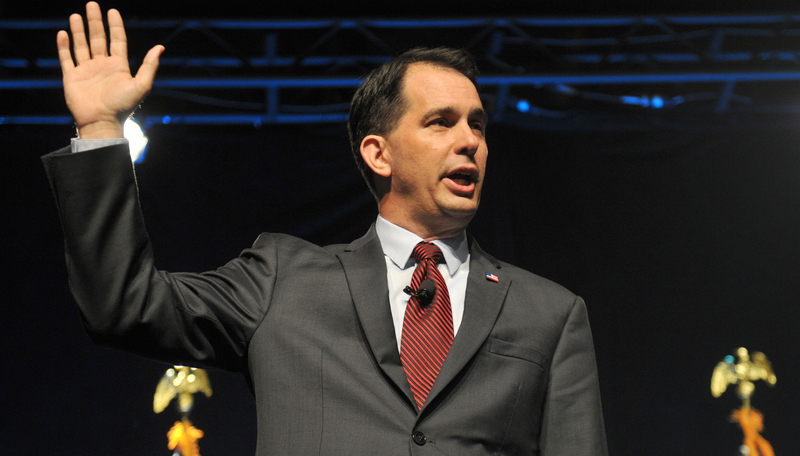 Walker will hold a news conference in Madison, Wisconsin, at 6 p.m. ET, presumably to officially announce his decision. While the majority of the GOP presidential candidates have been suffering in the shadow of frontrunner Donald Trump, Walker has been making a name for himself in several unfortunate ways. And it shows: In the most recent CNN survey, which had Carly Fiorina jumping to the No. 2 spot, Walker received less than one half of 1 percentage point. As CNN pointed out, his loss was more dramatic than those of the other four candidates who received approximately the same support (or lack thereof). In the beginning of the campaign season, Walker was actually leading in Iowa, before dropping in early September and flat-lining since then. Walker had a lackluster showing in both of the Republican debates, falling in the bottom spots of speaking times, though many said he at least performed better in the second go-round. After all, he fired at Trump, "We don't need an apprentice in the White House. We have one right now. And he told us all the things we wanted to hear back in 2008. We don't know who you are or where you're going. We need someone who can actually get the job done." But that wasn't enough for Walker to save face for his many other political issues. Like when he tweeted out a T-shirt advertisement for all those "lady patriots" out there. Or when his healthcare reform plan just didn't make any sense. Or when he kept using a woman's story as a political tool to argue against unions, despite her repeated requests for him to stop. It's a tough blow for Walker, but probably the smart move. In a crowded field of what was once 16 candidates, following in the footsteps of Rick Perry, who dropped out about a week and a half earlier, was likely the best option. Walker might have been considered a political leader at one point, but it's going to be hard for candidates with extensive political experience to push back against the leading anti-establishment sentiment. Now that the second debate is over and polls are getting more cutthroat, it won't be surprising to see more candidates reevaluate their decisions to run. The field will only get narrower from here.